To provide at-risk and homeless youth with housing, employment, professional support and adventure-based learning that empowers them to live healthy and independent lives. Use adventure-based experiences for learning and to drive positive ambition. Empower young adults with effective, practical tools to live healthy and independent lives. Inspire youth to cultivate healthy, purposeful directiion in their lives. Zero Ceiling provides employment and adventure-based learning programs that empower at-risk and homeless youth to develop the life skills needed to choose a healthier path and set them up for a successful life. Since 1997, we have served over 4,000 British Columbian at-risk and homeless youth through our Adventure Sessions & over 70 youth in our Work 2 Live program. Our programs provide transformative mountain-based adventure and employment experiences in Whistler, BC. Zero Ceiling ADVENTURE SESSIONS provide youth, 16 to 24, with an empowering, inspiring and often transformative break from their day-to-day challenges. Many of these youth live on the street. All come to us via specific youth groups from Metro Vancouver and the Sea to Sky corridor. 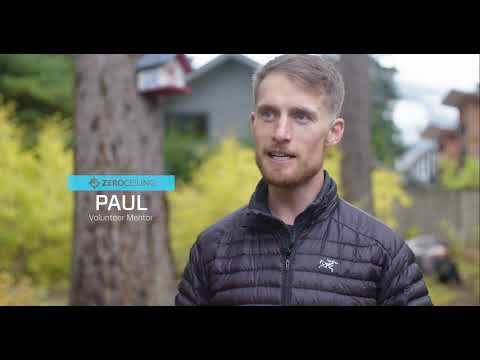 In partnership with Whistler Blackcomb and The Adventure Group, participants come to Whistler to go skiing, snowboarding, mountain biking, zip-lining, white-water rafting, amongst other adventures. Professional guidance and instruction are provided. These experiences provide the youth with a glimpse of a potentially different future, in an inspiring mountain setting. WORK 2 LIVE is a comprehensive 12-month program that provides subsidized housing, employment, adventure-based learning, and ongoing professional support. Youth, 19 to 24, benefit from stable housing, allowing them to focus on aspects of the program that promote personal growth and a healthy lifestyle. In partnership with Whistler Blackcomb, Zero Ceiling provides employment where youth earn valuable experience and the resources necessary to live independently. . Participants can use this program as a compass to literally rebuild and transform their lives, shifting their futures from streets to peaks.